neetsmarketing : How Can Writers Use their Photos on Social Media? 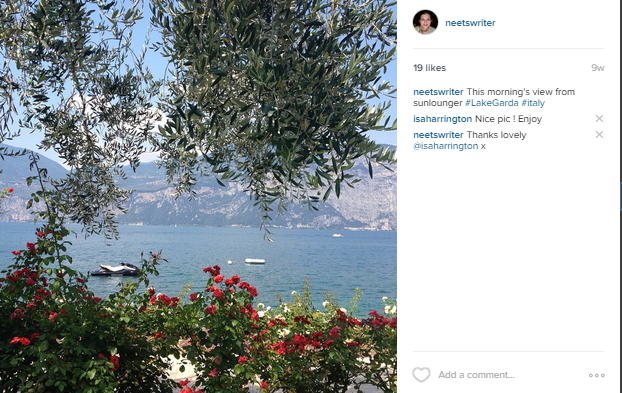 How Can Writers Use their Photos on Social Media? As a writer, it's worth taking photos wherever you go, on your phone and camera; and you can use them again and again: on Instagram, Pinterest, Twitter, Facebook, with your blog posts; as well as for profile headers. Social media has become more visual, so you're likely to receive more engagement when using them. I've used the one below, taken in July with my iPhone when visiting Venice, on Instagram and Twitter at the time, then for a blog post, and more recently for neetswriter Twitter and Facebook profile headers. My work in progress is set in Venice in the eighteenth century, so this fits nicely with my 'brand'. I snap away on days out to country houses, museums, art galleries, on scenic walks, when travelling; and when baking, although sometimes it can be tricky to make food look good in a photo. 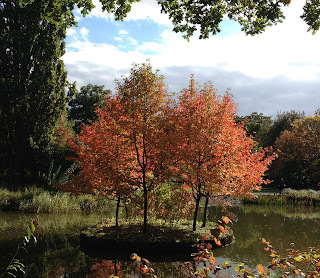 Writerly events, book launches and writers' conferences also provide good photo opportunities. Instagram recently turned five years old, and you can find me here. I've been on Instagram for a few years, and although I'm not there every day, I go through phases where I use it a lot. A wide range of filters can be used to adjust photos. Useful if you have a writing deadline or something else going on in your life, but want to stay visible on social media. It's quick, and there isn't much interaction after you've posted the photo (unlike on Twitter and Facebook). Lots of readers, book bloggers, publishers and agents hang out there. Liking photos on Instagram is a way to say thank you to those who support you on other forms of social media, for example to someone who doesn't blog, but who supports yours. You can post graphics for your books, especially when they're on offer. Photos can be shared to Facebook easily, and you can set up Instagram so photos automatically appear on your Facebook timeline, if you wish to. You'll also need to go into Facebook and set up the Instagram app. 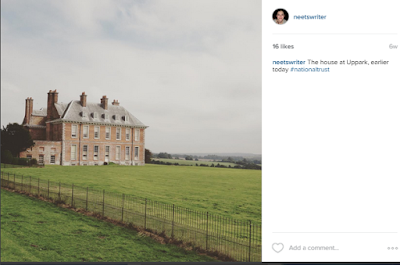 Instagram is: 'Generating Higher Engagement than Facebook, and Growing Fast' according to Social Media Today. If you share an Instagram photo to Twitter, the photo isn't displayed in the Tweet. I tend to post photos directly to Twitter instead (or as well as on Instagram), as they receive more engagement on Twitter this way. If you add a link to a photo on Instagram, it isn't clickable. For example, if you upload a photo and link to your blog post, someone would need to copy and paste that link into a search engine. The best way around this (and a method often used) is to add text to say 'link in bio' (if the link is in your bio, of course!). 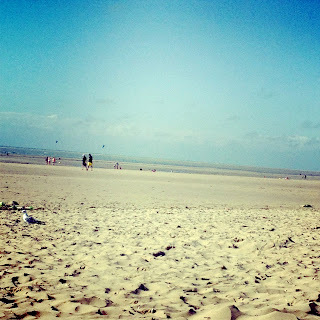 Instagram works best with phones, and is intended to be immediate, ie. posted while you're there. Most country houses I visit don't have 3G phone reception or WiFi, so sometimes I post photos from these places afterwards. Not all of those Facebook Friends and Twitter followers you've built up have joined yet, so your reach is limited (unless you share photos to Facebook, sharing to Twitter doesn't do much-see above). 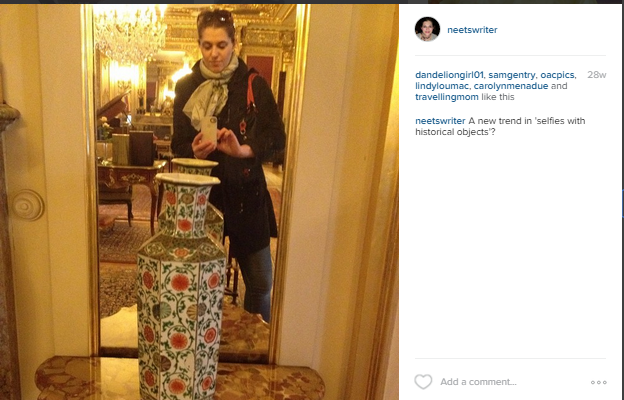 How do writers use Instagram? To post photos of what inspires them, their TBR piles and their writing. 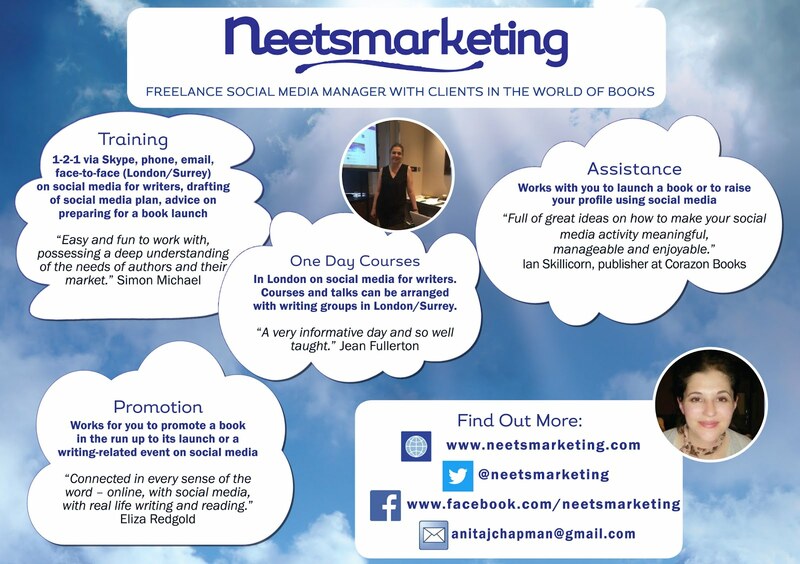 To interact with other writers, readers, book bloggers, agents, publishers. 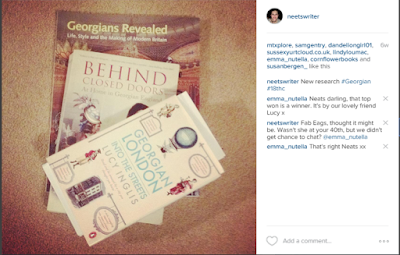 To find readers by using hashtags, or by searching for them. Follow those who I know already on other social media, and those who post photos and videos of Italy, and of country houses. Mainly by posting photos on days out, of TBR piles, of research books, and on holidays; also sometimes of flowers and cakes (when I get around to making them). 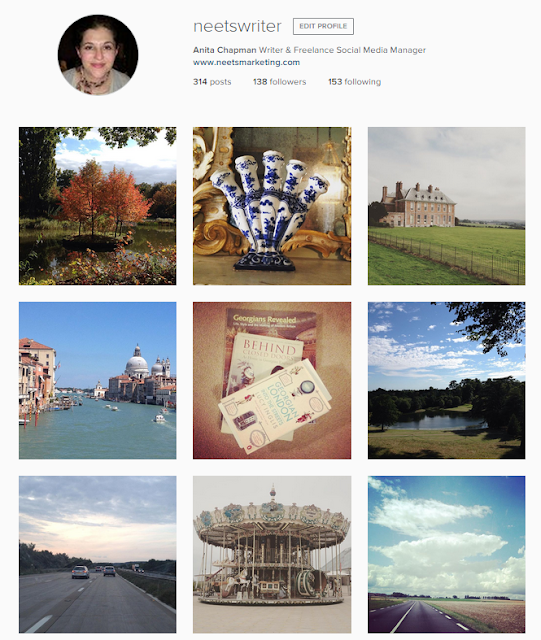 This is one of my favourite Instagram accounts by Nicolee Drake @cucinadigitale, who posts wonderful photos from Italy. See my blog post on hashtags (written after this post was published). Pinterest is another way to connect with readers. You can have boards for whatever you like, connecting into your brand again. I have boards for Italy and for each of my novels. I also have a secret board for my work in progress with links to research (a handy way to keep track of them), which I'll share when the book is ready. Boards linked to novels can be useful for finding inspiration: if I need to picture the green dress my main character is wearing, I find a photo online, and link to it in Pinterest. Photos on Pinterest can be liked and shared, or 'repinned'. They can also be shared to Facebook, but I don't see much of this. I follow many eighteenth century boards which helps me to escape into that world when I'm working on my WIP. You might see the 'Pin it' button when you read blog posts and articles. For example, if you hover your mouse over the top photo in this post, you'll see the option, which enables you to share this blog post with that photo to one of your boards on Pinterest. Like with Instagram, reach on Pinterest is limited because not everyone seems to be there yet. I have 250 followers on Pinterest, compared to much bigger numbers on Twitter and Facebook (as mentioned above). When joining Instagram and Pinterest, it's worth using the same profile photo and bio from Twitter, Facebook and other social media accounts so your Friends and followers know it's you. I post links to articles like these on Twitter from my @neetsmarketing account, and on my neetsmarketing Facebook Page. 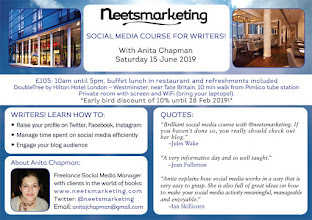 In other news, I recently ran a Social Media Course for Writers at The Mandolay Hotel in Guildford, where the staff went to great trouble to ensure the day ran smoothly (my feedback here on their Facebook Page). A lovely group of writers attended, and there are quotes from attendees on my website here. A possible course is planned in London, spring 2016, subject to demand. If you'd like to receive email notifications about future courses, you can contact me here. 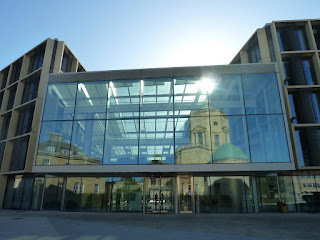 A few weeks ago, I went to a committee meeting as Publicity Officer for the next Historical Novel Society Conference (2-4 Sept 2016), which took place at the venue, the Mathematical Institute, Oxford University; and we had a lovely lunch afterwards. Keynote speakers at the conference are Melvyn Bragg, Fay Weldon, Tracy Chevalier and Kate Williams. Elizabeth Chadwick is a guest of honour, and Jo Baker is a special guest. The website went live this week (with lots more info on other speakers too), and booking is open! And here's the paragraph I wrote for the website. You can follow the Historical Novel Society on Twitter @histnovsoc (conference hashtag #HNSOxford16) and Facebook; plus videos from the conference in 2014 are here, and my neetswriter blog post from that conference is here. 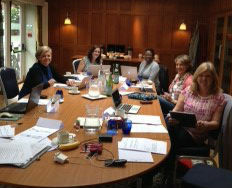 And look at this wonderful photo taken by Lorna Fergusson on the day of our committee meeting, at the venue. On 6 November, I'm excited to tell you that bestselling author of medieval thrillers, E.M. Powell will be a guest on this blog with a post on Triberr. Very interesting and useful, as always. 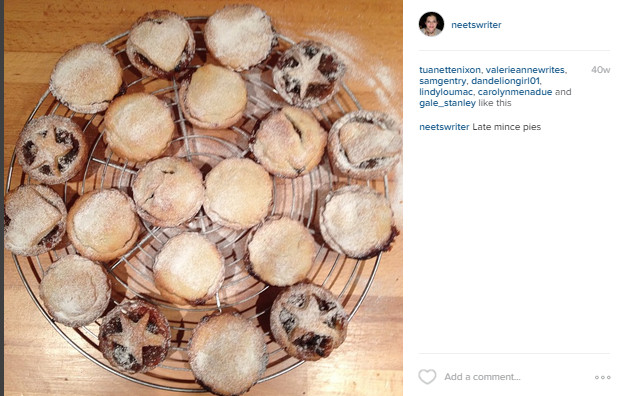 I've dipped my toe in the water with Pinterest, but haven't investigated Instagram yet. I'm not a visual person and I tend to forget that other people are. Thank you so much for another invaluable post, Anita. I'm on Pinterest but haven't ventured into Instagram yet. Thanks for reading, Wendy! Glad you found it helpful. Will check that I'm following you on Pinterest.